Julian Johnston achieved over 100 million in sales volume last year, the only Broker to achieve that distinction in Miami Beach, being calculated by closed sales on MLS. I have been selling luxury waterfront real estate and helping clients close deals since 2001. Being the number #1 broker in Miami Beach for 2015 was a great achievement. Miami Beach waterfront home and condo real estate expert Julian Johnston was recently ranked the number one agent #1 in the city of Miami Beach. He achieved two records, both the highest volume of sales and the greatest number of luxury transactions last year. Julian Johnston achieved over 100 million in sales volume last year, the only Broker to achieve that distinction in Miami Beach, being calculated by closed sales on MLS. The listings sold by Julian had with an average price of nearly $3.4 million. Some of the listings sold by Julian last year that helped him achieve the number one ranking include 401 East Rivo Alto Drive, 1433 W 22nd on Sunset Islands, 709 E Dilido Drive, 429 N Hibiscus Drive on Hibiscus Island, and two luxury condos in Continuum. 401 E Rivo Alto was a record sale for a renovated home with seven bedrooms, six and half bathroom home located in Rivo Alto Island which is part of the Venetian Islands and features a strong tropical design. The 6,400 square foot home features a courtyard, Italian kitchen, Crestron smart home, a pool, and an oversized dock among its features. Another listing sold by Julian is 709 East Dilido Drive which was a record price per square foot for new construction home on Venetian Islands. Part of Di Lido Island which is also part of the Venetian Islands, this 6,446 square foot property sits on a large lot and has six bedrooms and bathrooms and features design by architect Max Strang plus interior styling by the renowned New York-based firm of Gachot. Features include white oak flooring in the living area, an entertaining area with a poolside barbecue, and more. 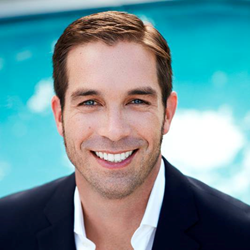 Julian Johnston is a luxury Miami Beach Realtor specializing in Miami Beach waterfront homes and condos for sale. In 2012, Julian made a record high $25,000,000 sale when he sold the penthouse in Miami Beach's Continuum condo in South Beach. He currently is the broker and owner of Calibre International Realty selling waterfront properties in Miami Beach waterfront home and luxury condo communities, and also has experience in investment properties. You can contact Julian Johnston by calling 305.502.3985.